There may not have been many of you — the former supply ship Saturn’s crew of 160 never included many more than 40 sailors during its 25-year run with Military Sealift Command — but here’s a respectful nod to you and your old ride, which was sunk in the Atlantic Wednesday after the George H.W. 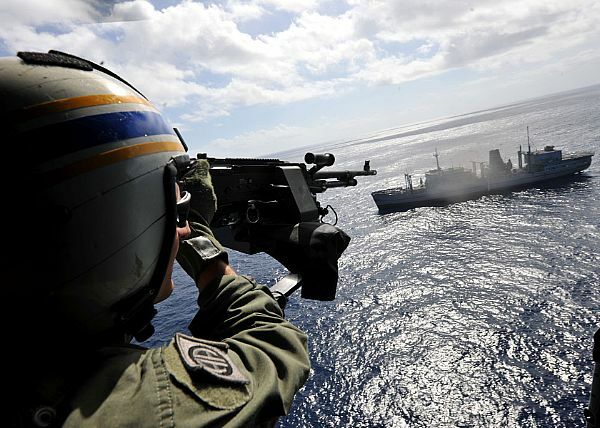 Bush Strike Group spent two days attacking the decommissioned ship during a training/sinking exercise. Ships from Destroyer Squadron 22 and aircraft from Carrier Air Wing 8, along with Patrol Squadrons 10 and 45, took part in the tactical training exercise using surface-to-surface, air-to-surface and surface-to-air live fire, U.S. 2nd Fleet announced. The destroyer Mitscher and the cruisers Philippine Sea and Gettysburg launched missiles, 5-inch guns, Close-In Weapons System, and 25 mm and .50-cal weapons at Saturn. In addition, aircraft and helicopters from CVW-8 launched from the carrier Bush employed bombs and air-to-surface missiles during the two-day exercise — what the fleet called “a unique opportunity to practice combat scenarios, to include tactics and procedures.” The attacks ramped up in intensity over the two-day period; it was the 5-inch rounds that finally did her in. The Navy has put a moratorium on such training sinkings after 2010 to conduct a comprehensive review of the requirements, costs, benefits and environmental impacts of the current process. Saturn, which began life as a British Royal Fleet auxiliary launched in 1966, had a great run. She’s now resting at the bottom of the Atlantic, about 250 miles off the East Coast. So, a toast to the ship and those who served! I’ve never understood why the Navy doesn’t release more photos and videos of SinkEx. I doubt there is some security problem with seeing how much damage an old warwagon can handle, or what the weapons can do to it – there is plenty of that available online anyway, why not let all of us have watch the fun too? My old ship, her demnise will be sadly felt by many of her old shipmates. She served us well on this side of the pond, I am sure she served you well also. Farewell RFA Stromness. She was my first job as Navigating Officer in 1975 and I stayed there 18 months. She was a beautiful ship and I earned my first “Well met” from a Flag Officer driviving her to join a task force. She served the MSC well, too. How fortunate we all were. My old ship also. I was the last RFA Chief Engineer Officer in RFA Stromness, still a grand ship after all her years with RFA. I also served on her as RFA STROMNESS as the last STO(N) in charge of the on-board replenishment party. What is not reported here is that she had a prominent role in the operation to re-take the Falklands Islands, surviving many Argentine air attacks while offloading stores and equipment in “bomb alley” San Carlos Water. A very fine ship RIP.